When I heard TCM was airing DUCK SOUP tonight, I set the DVR. I got home as soon as I could (after an excellent Tom Rush concert) and began watching before it was finished recording. This is one of my favorite movies of all time, right up there in my personal comedy pantheon with such gems as AIRPLANE! and BLAZING SADDLES. It’s one of the most anarchic comedies ever made, and certainly one of the funniest. If you think today’s politicians are a bunch of looney tunes, wait til you get a load of these guys. We begin as Freedonia is on the brink of bankruptcy. Mrs. Teasdale (perennial Marx foil Margaret Dumont) will loan the country twenty million dollars only if her choice of leader is appointed. She wants Rufus T. Firefly (Groucho), a sarcastic, lecherous wise guy (Teasdale: “It’s a gala day for you.” Firefly: “Well, a gal a day is plenty for me, I don’t think I can handle any more”). Firefly’s accompanied by his personal secretary, Bob Roland (Zeppo). Meanwhile, Ambassador Trentino of rival Sylvania plots to woo the old dame for her money. He sends his two top spies, Chicolini and Pinky (Chico and Harpo), disguised as peanut vendors, to dig up dirt on Firefly. Soon Chicolini is made secretary of war. Firefly and Bob, suspecting Tentino’s up to no good, devise a plan to insult Trentino and start a war. But Rufus is the one insulted when Trentino calls him an “upstart”, and war is declared! The spies are sent to Mrs. Teasdale’s house to steal Freedonia’s war plans, and they both impersonate Firefly to perform the dastardly deed. Chicolini gets caught and is put on trial for treason. The trial’s interrupted by Trentino, who’s come to make amends with Firefly. But the ‘headstrong’ Rufus ends up slapping the ambassador again, and the war is on. The battle of Freedonia begins, with the brothers dressed in different war uniforms as the battle rages. The bullets fly, as do the jokes (Bob: “General Smith reports a gas attack. He wants to know what to do.” Firefly: “Tell him to take a teaspoon of bicarbonate of soda and half a glass of water.”) Eventually, Sylvania is defeated when Trentino’s head gets trapped in a door and the madcap brothers pelt him with fruit, causing him to surrender. Freedonia victorious! It’s hard to describe all the lunacy this film offers. The puns and one-liners fly fast and furious (my favorite line: “Remember we’re fighting for this woman’s honor, which is more than she ever did.”) Sight gags abound, like the running battle between the peanut vending spies and lemonade stand owner Edgar Kennedy. And of course there’s the classic ‘mirror scene’ with Groucho and Harpo, later reprised by the silent Harpo and Lucille Ball in TV’s I LOVE LUCY. 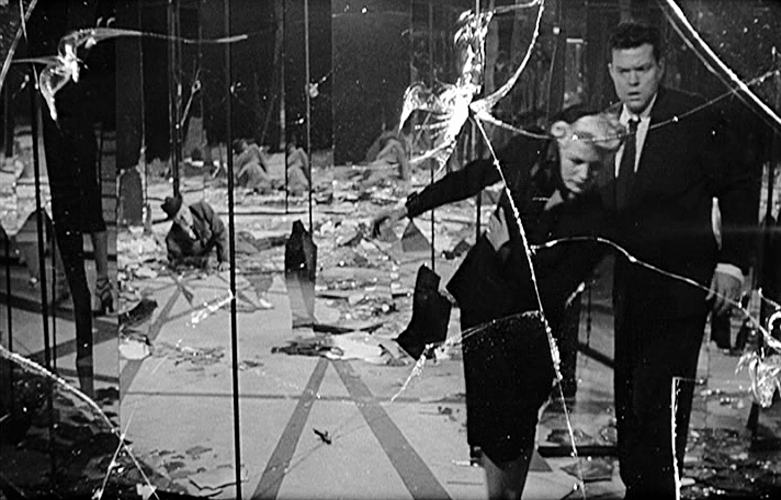 This was the last of five films the Marxes made for Paramount Pictures. 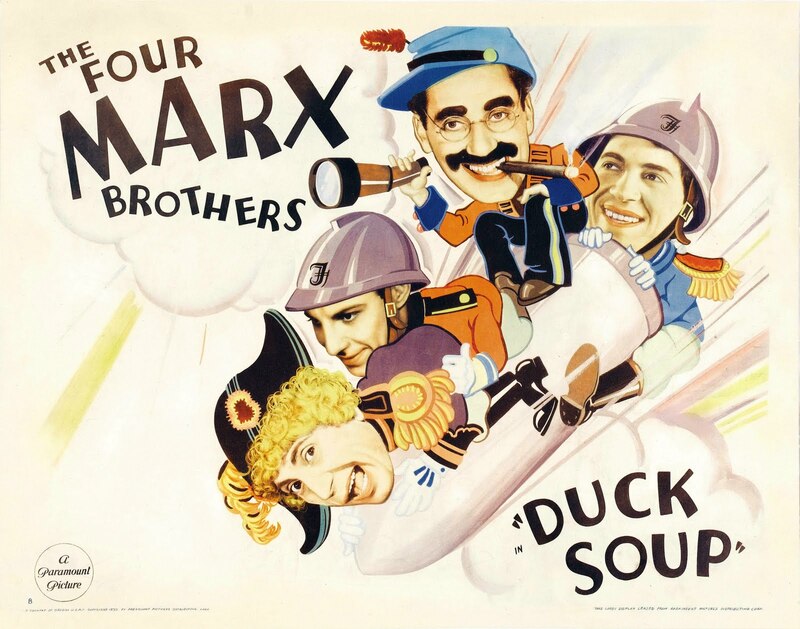 DUCK SOUP was so ahead of it’s time, the movie did poor at the box-office, as they were released from their contract. Signing with MGM in 1935, the boys went on to star in hits like A NIGHT AT THE OPERA and A DAY AT THE RACES. But for sheer, unadulterated Marx madness, this is just their greatest comedy, indeed one of the best of all time. If you didn’t watch the broadcast, I hope you DVR’d it. And if you didn’t, go out and find a copy quick. I guarantee you won’t be disappointed. Hail, hail Freedonia!! First saw this movie back in 1998 when I was 10 years old. I have never stopped laughing. I’d rather vote for Rufus T Firefly than Trump or Hilary! !